The Vancouver Heritage Foundation’s 13th annual Heritage House Tour is coming up on Sunday, June 7th. This popular event, that usually sells out, will give participants and exclusive look inside 14 historic Vancouver homes through a self-guided tour. 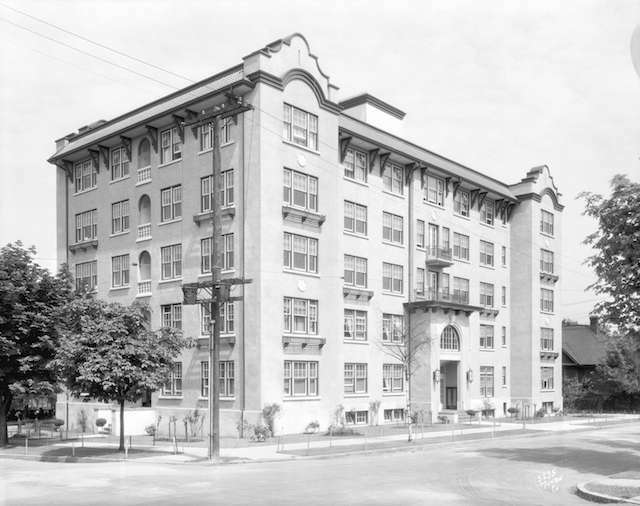 1928: Queen Charlotte Apartments at 1101 Nicola Street, Vancouver. Archives #Bu N261.1. From luxury apartments and elegant homes to an industrial conversion and vintage charm. In 2015, Vancouver Heritage Foundation is looking at a range of ways Vancouverites are living in heritage. There are 9 stops on the tour, comprising 14 homes and 40 years of history. A special inclusion this year are two very different apartment buildings. See four lovingly cared for units inside the West End’s historic Queen Charlotte Apartments and three contemporary lofts inside a reinvigorated warehouse in Southeast False Creek. Built in 1927, the Queen Charlotte Apartments is a prime example of the early luxury “hotel/apartment” buildings that dotted the West End with its once grand lobby, one of two of the province’s surviving still-operational cage elevators and beautiful early Art Deco details. In contrast, the industrial conversion of the 1913/15 B.C.Telephone building offers original exposed brick walls and some of the largest first growth wood beams you are likely to see. For those who love a traditional heritage house, there are 7 more private homes on tour, ranging from a cozy and charming bungalow with quirky history and ties to the PNE to an 1899 West End masterpiece that recently benefitted from an award-winning major restoration. There will be a pre-tour lecture on June 2nd with author Michael Kluckner, A Brief History of the Vancouver Apartment and Condo. Michael will offer an illustrated talk exploring the evolution of apartment and condo living in the city of Vancouver. Proceeds from both the tour and the talk support VHF’s efforts to conserve Vancouver’s heritage. Tickets: Available online for $40 / $30 with valid student ID. You can also purchase in person via At Home West Vancouver (1530 Marine Drive, West Vancouver), and Benjamin Moore – Coast Decorating Centre (4464 Main Street, Vancouver). Follow the Vancouver Heritage Foundation on Facebook and Twitter for more information about the tour and other special events.